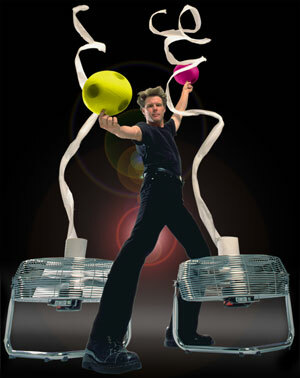 Since winning First Place in the International Juggling Championships*, Collegiate Entertainer of the Year** and 1998 Comedy Entertainer of the Year***, Mark Nizer has changed the way people view the world. The impossible is possible, the improbable is probable. Mark’s twenty years on stage has taken his one man show to thousands of venues around the world, including the Kennedy Center and Lincoln Center for the Performing Arts three times. Creating new ways to delight and entertain his audiences is at the the heart of Mark's mission. His time is spent tinkering with all sorts of gadgets, midi devices, sensors and toys. He is constantly working on new ideas and tricks to add to his show. With an occasional success and many failures; Mark has spent his life nurturing and growing the show you are about to see. Mark Nizer has opened for George Burns, Ray Charles and Bob Hope. He has appeared on The Arsenio Hall Show, LA Law, Bob Hope and Other Young Comedians, MTV, Comic Strip Live and Carolines A&E. Believe it or not, he even did a show for the OJ Jury. Look for him this season touring with Barry Manilow. Mark was raised in Concord, Mass. He attended University of New Hampshire and San Diego State and holds a degree in Psychology. He currently lives in Free Union, VA with his wife Mary-Scott and their daughters Haley, Madison and Ruby. When Mark is not performing, look for him overhead flying his Hang Glider. Lazer Diablo is Patented to Mark Nizer, all rights reserved.